There is no justice if your name is Assange. It’s not the fist time Mr Clegg, has put his foot in it over the Assange case. 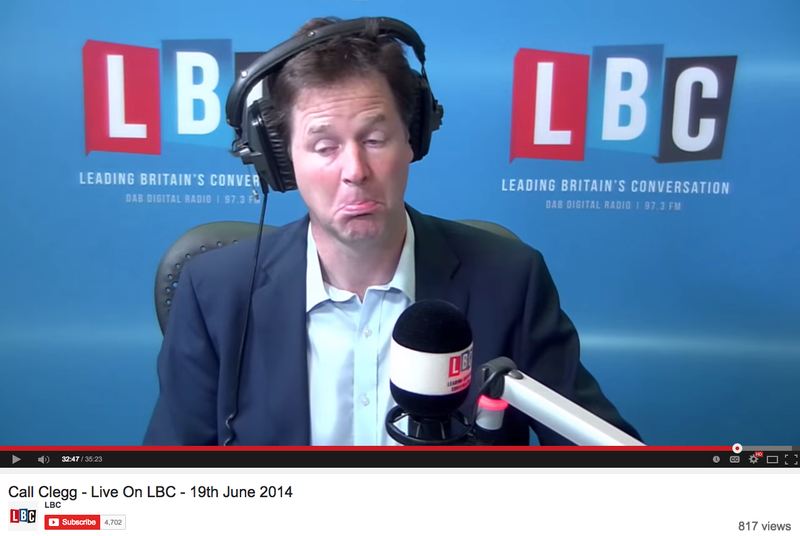 On 19th of June 2014, the second Anniversary of the WikiLeaks founder seeking sanctuary inside the Ecuadorian Embassy, at the same LBC programme, Mr Clegg was clearly surprised to be asked about him and got into a real muddle. He suggested Julian Assange ‘should be facing justice in his own country’ then proceeded with the proverbial ‘Sweden is not a banana republic’. So he was under the impression Assange was Swedish!!! Then again he demonstrated his ignorance of the details of the case by saying: ” they will give him a fair trial in line with Swedish law’. He was clearly ignorant of, or chose to ignore that the case is in preliminary investigation stage, he is sought for questioning, there has been no decision by the Swedish judiciary whether to charge him or not, which would determine whether the case went to trial. He has not learned much during the last six months that have ensued has he? He put his foot into it again saying Assange faced charges in Sweden (09:20 min). WikiLeaks issued a statement from Julian Assange setting the record straight, protesting at the injustice, invoking Magna Carta and explaining he was seeking legal advice with regards to legal action against Mr Clegg for defamation. The latter instead of apologising or issuing a correction, which he could have easily done, he instead chose to attack the victim of his error with arrogance and prejudice, calling him self-publicist for protesting his innocence and seeking the protection of the law. This came from a man who holds one of the highest offices in the land, towards a man who is under the protection of political asylum. It seems there is no justice if your name is Assange. Jim Curran: Good morning Nick, I have a brief request for you. I am requesting you to contact foreign secretary and ask him to ask the Swedish police to come and question Julian Assange at the Ecuadorian Embassy or via video link. This would save tax payers an awful lot of money, and free up the police for more important matters. Nick Ferrari: Today is the second year since Mr Assange sought sanctuary at the embassy. The policing bill, deputy prime minister, is at £6.5 million. Mr Clegg: Look, I understand people’s frustration about this mounting bill that is landing on our lap. Julian Assange, if I understand correctly, for perfectly good reasons is…should be facing justice in his own home country. Nick Ferrari: He is frightened he will be abducted or somehow swept off to the US. Nick Clegg: Look, Sweden is not a banana republic, Sweden as far as I can make out is a pretty civilised country with a pretty sophisticated justice system, I am assuming they will give him a fair trial in line with Swedish law. Nick Ferrari: What about the idea of a video link or something like that. Nick Clegg: I have no idea whether that… Jim, I have no idea whether that would work, I am not a Swedish prosecutor but I do accept that the best thing would be for Julian Assange to, basically, put himself into the hands of the Swedish judicial system, not into the hands, if you like, of the British police, the bill of which is footed by the British taxpayer.